This is my favorite loop knot tied in the bight. It's secure, nearly symmetric, easy to tie, isn't picky about load direction and usually resists jamming*. There are actually two good ways to tie it, and the easier way is shown above. The twist method, shown below, works better when you don't have as much slack to work with. You should use this loop often, so learn both methods. 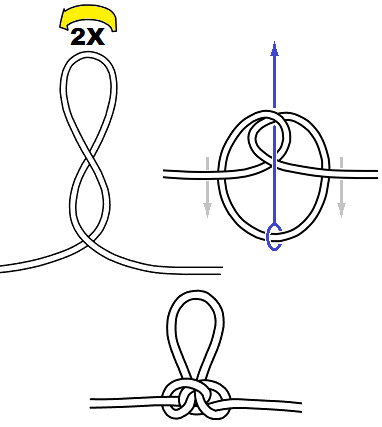 Since the Butterfly Loop doesn't need to have an object in the loop to keep it from collapsing when the parent line is under tension, it is sometimes used as a method to temporarily isolate a worn or damaged part of the rope, or just to take up slack. *If you come across a jammed Butterfly Loop, you can make it easier to untie by pulling hard on the parent line while leaving the loop unloaded. For more information on jammed knots see my tips for untying jammed knots.